Aidan O'Brien wins his sixth race of the Royal Meeting, the one mile four furlong G2 Hardwicke Stakes, with Idaho. The success sealed victory in the 2017 QIPCO Royal Ascot trainers' title for the Ballydoyle trainer. Of Idaho, O'Brien said: " He is a full-brother to Highland Reel , he has a fabulous pedigree and we've always loved him. Epsom was his first run of the year and he arrived at the track only an hour before the race [after travel problems] and he was very upset and he never got time to cool down. "He was very unlucky in the St Leger last year, he had a lovely position in the straight," reflected O'Brien of the Classic in which the horse unseated jockey Seamie Heffernan. 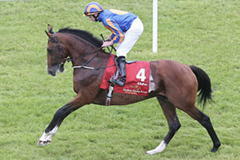 O'Brien added: "Look we are delighted - he is by Galileo and they never know when to stop improving and trying . Seamie gave him a peach of a ride. "We were very happy coming into the race - Ben who rides him at home was over the moon with him, he felt he'd really come forward, while Matt's done a great job with him today too." Of winning the QIPCO trainers' award for the eighth time, and for the third year in succession, O'Brien said: "I am in a privileged position to be working with such people and horses, it is hard work by a lot of people day in and day out." Of the horse's chances, O'Brien said: "It's very sporting of the lads to let him run, he was in the Hardwicke Stakes as well, but has been redirected to the last. He is a very classy horse." Seamie Heffernan, riding his fourth winner at the Royal Meeting, put the victory down to a Chinese handshake before the race. He said: "Just before I went out, I shook hands with seven or eight Chinese men and they were all looking at me, so I could see the luck! "He was placed last year in two Classics, when he was possibly a little bit weak. He sweats a little bit like Highland Reel [full brother] and he is learning, so it was pretty easy. "I got beat in this race last year [second, Highland Reel] when I was little unlucky as the stick got knocked out of my hand so it was nice to have a winner in this race. "Winning here is something you could get addicted here, so I hope I could keep fuelling it. "He ran a nice race at Epsom last time [sixth Coronation Cup] and today I followed Ryan [Moore, aboard Dartmouth], but to be fair to Idaho, he took me into the race, he was travelling so sweetly and I rode him confidently. "I had a lovely draw and tactically, the race worked out as I thought it would. I wanted to follow Ryan and my lad's a good stayer, so I had a nice toe into the race - we thought he would run well." The fast-finishing Barsanti, trained in Newmarket by Roger Varian and ridden by Andrea Atzeni, snatched second in the G2 Hardwicke Stakes. In his second run of the season, the five-year-old son of Champs Elysees was denied the win by half a length in the 1m 4f contest. Varian was thrilled with his 20/1 shot: "He's run a career best. We're gutted not to win - he's run so well. But he's run a great race, very proud of the horse. "The winner wasn't stopping was he? But we didn't have quite as clear a run." Atzeni said: "It was a great run. Probably the draw beat us, a better draw and we'd have finished that bit closer - it might have made a difference. His homework was good and the horse looked great in the paddock so we were very confident." Sir Michael Stoute will have to wait at least another year to break Sir Henry Cecil's record as the winning-most trainer at Royal Ascot. The Stoute-trained Dartmouth - 9/4 favourite for the G2 Hardwicke Stakes - finished fourth behind Idaho after leading for a long way down the home straight. Stoute, who like Cecil has recorded 75 victories at Royal Ascot, said: "It was a game run. I thought it was looking good until it got really serious. "But there you are - he wasn't good enough on the day." Ryan Moore, rider of Her Majesty The Queen's runner, Dartmouth, said: "The ground was just too quick. He ran a good race." Chemical Charge, a 25/1 long-shot, out-ran his price as he finished third in the hands of jockey Oisin Murphy. Trainer Ralph Beckett said: "It was a career best - I think we can safely assume that. "He enjoyed the fast ground but didn't get the gap when he needed it; whether that made the difference is academic. "He might go travelling - to the States."